Hire the best pulsed plasma ion nitriding technology available! 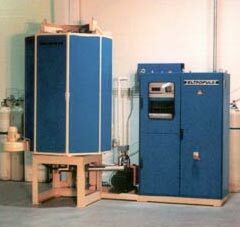 Eltro Services, Inc. has the newest, most technically advanced pulsed plasma ion nitriding furnaces in the Midwest. If you have parts that need to be hardened, we can do the work better, faster, and more affordably than ANYONE. Process and Ship Direct -- Pulsed plasma ion nitriding is a proven technique for improving the surface hardness, fatigue strength and corrosion resistance of ferrous metal parts. Work is performed at low temperatures, typically under 1,000°F. This minimized part growth and distortion so you can process machined parts and ship them direct to the assembly line. You can even mask parts for selective hardening. Expressway Accessible -- We have a brand new plant a few miles from Detroit. This makes Eltro Services, Inc. "expressway-accessible" to companies in Michigan, Pennsylvania, Ohio, Indiana, Illinois, and Canada. The Best on the Market -- All of the Eltro Services, Inc. machines are brand new, German-Built ELTROPULS furnaces -- arguably the best pulsed plasma ion nitriding machines on the market. Efficient - Eltro Services, Inc. can handle your job. If we need more capacity, we can have new equipment on the line in a short time. (It's no problem, because we represent Eltropuls in the United States.) The bottom line is Eltro Services, Inc. is in a unique position to handle your ion nitriding needs efficiently.